PEARL RIVER, NY --(Marketwired - February 17, 2016) - ACORD, the insurance industry's global data standards and services association, today announced that Mick Ebeling and Casey Gerald will keynote this year's ACORD2016 event. ACORD2016 is the insurance industry's premier annual Standards, business and technology event, known for sessions and speakers that advance ideas and solutions to promote industry efficiency. Mick Ebeling is a technology trailblazer who was honored by Advertising Age as one of the "Top 50 Most Creative People" and received the 2014 Muhammad Ali Humanitarian of the Year Award. He is CEO of Not Impossible Labs, an organization that develops creative solutions to real-world problems and utilizes technology to benefit humanity. Casey Gerald is co-founder and CEO of MBAs Across America, a national movement of MBAs and entrepreneurs working to revitalize America. Video of his 2014 Harvard Business School commencement speech went viral, landing him on the cover of Fast Company magazine, who also named him one of the "Most Creative People in Business." He is emerging as a voice of the millennial generation on business, entrepreneurship, and finding a purpose. "Powerful new voices with fresh perspectives have always been a part of ACORD events," said Malou August, ACORD Director of Conference Programs. "We're very pleased that Mick and Casey will join us and contribute to that legacy." In addition to the keynote speakers and more than 60 interactive sessions, ACORD2016 will also feature 50 top solution providers displaying their products and services in a newly expanded Innovation Center. More than 50 percent of the exhibit space is already sold. And for the second year, the flagship ACORD event will host the final round of the annual ACORD Insurance Innovation Challenge, a competition which seeks to identify and promote innovation for the insurance industry. 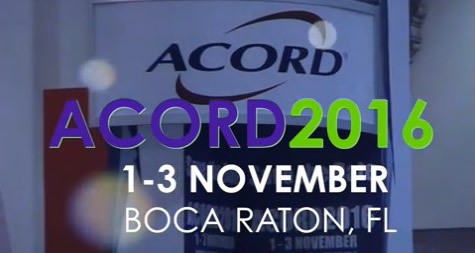 ACORD2016 takes place November 1-3, 2016 in Boca Raton, Florida. Registration is open now. For more information please visit www.acord.org/acordevent. ACORD (Association for Cooperative Operations Research and Development) is a global, nonprofit organization serving the insurance and related industries. ACORD works to improve data quality and information exchange for the insurance industry. ACORD members worldwide include hundreds of insurance and reinsurance companies, agents and brokers, software providers, financial services organizations and industry associations. ACORD maintains offices in New York and London. Click the image to learn more about why you should attend ACORD2016.